Automobile accidents happen every day, yet many drivers are unaware of what to do when they are involved in a car accident, and know even less about how to hire a New Jersey automobile accident attorney to represent them after the accident. But if you keep the following tips in mind during your decision-making, you can rest assured that you have hired a New Jersey automobile accident attorney who will get you the just compensation that you deserve. If you have been injured due to a negligent driver, it is crucial that you seek competent representation. One of the ways to determine competency of an attorney is to contact the American Bar Association. A representative will provide you with a list of New Jersey automobile accident attorney that are licensed to practice law. Once you have your list of lawyers, you need to look at your potential lawyers’ backgrounds and experience. You can do this by either contacting these lawyers or asking for referrals. A good New Jersey automobile accident attorney will even provide you with a free consultation to answer your questions. The legal field has many different specialties that require knowledge in a set of specialized laws and/or approaches in trial or negotiations. It is imperative that your choice of New Jersey automobile accident attorney has experience representing individuals involved in car accidents. Experience is a big factor in a successful case that will get you the compensation that you deserve. Cost is another issue for you to consider. Dealing with the personal injuries and body damages associated with a car accident can be expensive and a big financial burden for most individuals. As such, you should seek an attorney who takes cases on a contingency basis. After you have all the necessary information to make a sound decision, you should select the attorney whom you will feel most comfortable with and who you believe will get you the compensation that you deserve. 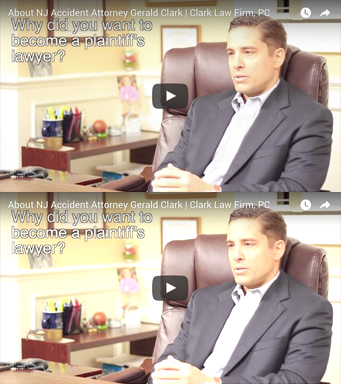 If you have any questions or would like to speak with a New Jersey automobile accident attorney, please do not hesitate to call one of the experienced attorneys at the Clark Law Firm, PC at 877-841-8855 for a free consultation.